Fewer demonstrators turned out on Saturday France-wide according to the French Interior Ministry. While the numbers are dwindling on the streets, there were few reports of violence or clashes for the so-called "Act XXI" this weekend. The Gilets Jaunes are looking for new ways of being heard. On the 21st weekend of anti-government protest about 22,300 Gilets Jaunes, Yellow Vest in English, against more than 33,000 the previous weekend took to the streets, with around 4,000 in Paris. The movement itself puts the figure at more than three times as high. This Saturday's figures amount to a tenth of the numbers at the peak of the street protest. A few Gilets Jaunes protestors and police clashed notably in the cities of Rouen in Normandy, Toulouse in the south-west of France and the town of Boulou in the Pyrénées. Overall, police said they carried out some fifteen thousand checks and detained 43 people. Near the Arc de Triomphe and the Champs-Elysées Avenue which were off limits for protestors, police booked nine people. Among them Eric Drouet, who has become a symbol of the Gilets Jaunes protest. He was one of the first people to call via social media for mass demonstrations in France against the government's proposed fuel tax. 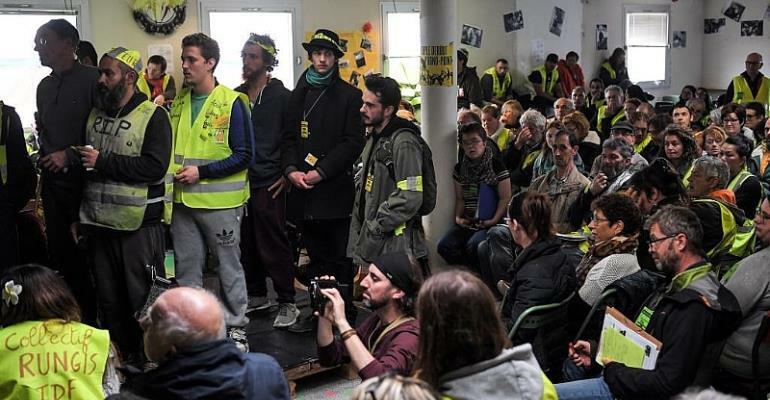 Meanwhile, in Saint Nazaire in the West of France, the Gilets Jaunes held a second big meeting to discuss the way forward. Called the "Assembly of Assemblies", it's the second time scores of anti-government protestors have come together from different parts of the country to work out how to and if they move on. Some would like to form a political party for the municipal elections slated for 2020. The idea does not have unanimous support among the 300 delegations represented at the meeting. Starting on Friday 5 April, the discussions are due to continue through Sunday 7 April. On Monday, the prime minister Edouard Philippe is due to present conclusions drawn from the Grand Debate to parliament. It took President Emmanuel Macron around France to garner opinions from local officals and local folk from January to March. According to official figures ten thousand meetings were held, two thousand opinions expressed online and 16,000 complaint books made available in town halls.